Okay, I’ll admit it: I’ve been a bad Cephaloblogger for the last two weeks. As in, I haven’t been posting anything since I announced that Jeanna won the Lunapads Contest. And there’s no excuse for it, because just in the last week there have been a slew of wonderful things for me to blog about – Thomas Beatie giving birth to his second child (a little brother for Susan! ), Chastity Bono transitioning (and Jamison Green writes a fantastic response to Chaz’s announcement), the turmoil in Albany threatening the passing of the Marriage Fairness Bill. But, I do have an excuse: I’ve been really busy! And while I have plenty of posts brewing in my head (and in my WordPress dashboard), I haven’t had the time to sit down and fully flesh them out yet (with the exception of this pathetic excuse for an explanation of my absence). So, just be assured that more Cephaloblog posts are on their way in the very near future. 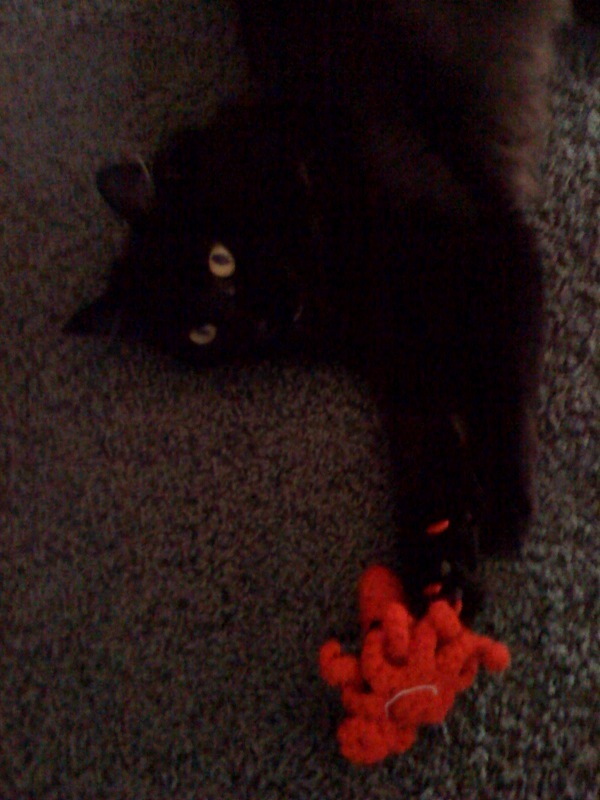 In the mean time, entertain yourself with this adorable photo of my beloved cat, Pepper, viciously attacking a squid (she is the squid hunter – Pepp has been engaged in the lengthy process of slowly tearing this squid apart for months). Oh yes, Sandra, she’s the most ferocious cat I’ve ever known that doesn’t have a mean bone in her body… except when it comes to squid, that is!